If you ever question how Batman patrols all of Gotham City every night, I reassure you that the Bat family is huge. 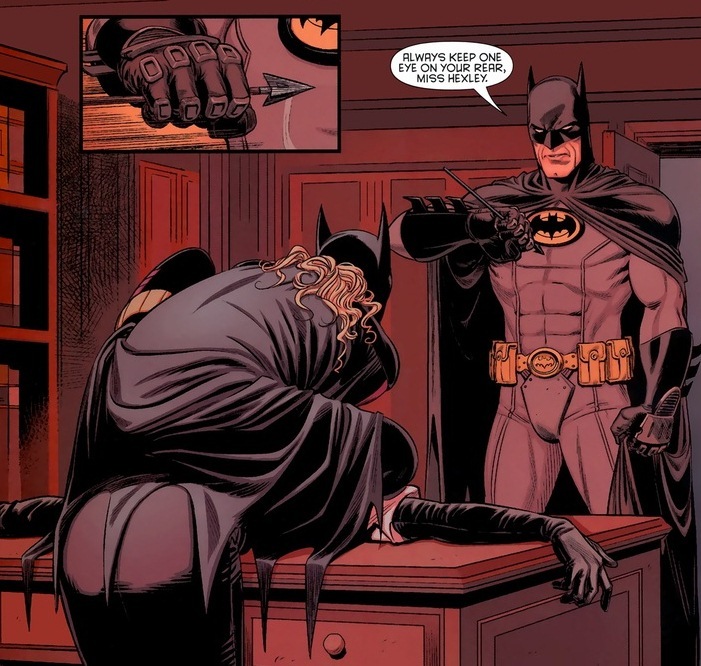 Criminals might not get sucker punched by the Batman himself, but don’t forget Robin, Nightwing, Batgirl, Batwoman, Huntress, Red Robin, Catwoman, Manhunter, Man-Bat, Azrael, Etrigan, and more. That’s a lot of kung fu in Gotham. 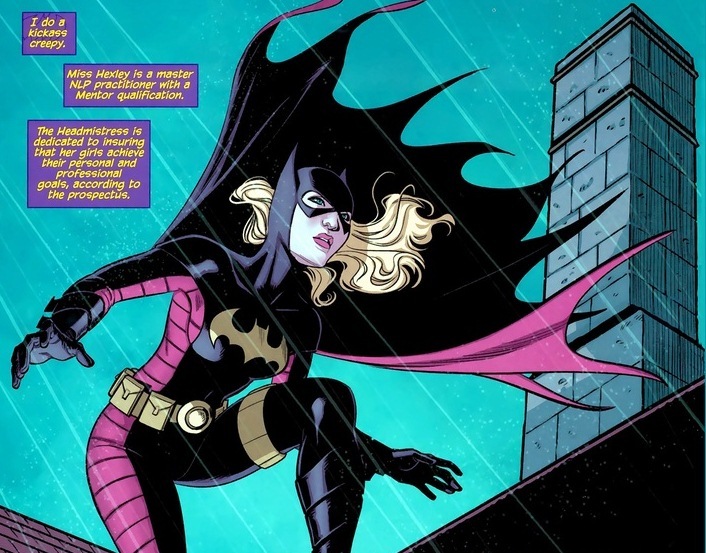 Today though, we’re taking a little look at Stephanie Brown, my favorite Batgirl. I know it’s fairly blasphemous to like Stephanie over Barbara Gordon (the original Batgirl and Nightwing’s redheaded paramour), but Stephanie’s 2009 series was an absolute delight, written by Brian Q. Miller and drawn by a whole bunch of talented artists. Unfortunately, in 2011, DC rebooted their entire lineup, and all of a sudden Barbara was back in the Batgirl role. Stephanie had just disappeared with no explanation given. Well, until the Batman Incorporated: Leviathan Strikes one-shot came out, written by Grant Morrison and drawn by Cameron Stewart. 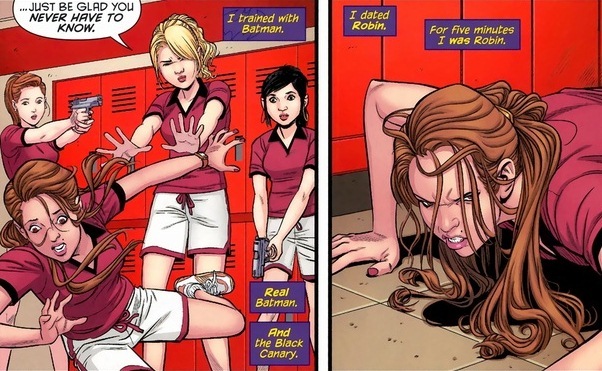 Though before we jump into the story, we should very quickly cover this Batgirl’s history. Y’see, she’s the daughter of Cluemaster, a C-list supervillain. Disgusted by his criminal actions, Stephanie put on a costume, called herself Spoiler, and set out to ruin her father’s plans. 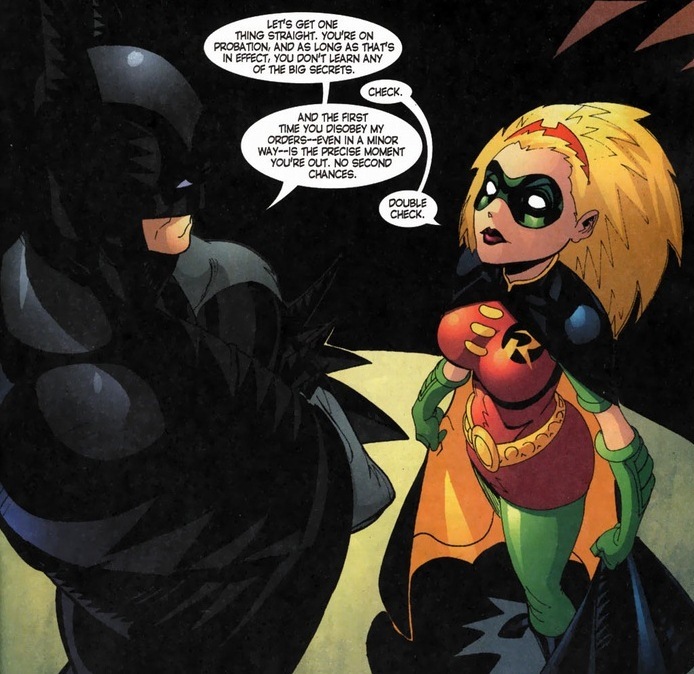 Along the way, she sparked up a friendship and eventual relationship with the Robin of the time, Tim Drake. And when Tim’s dad found out about his little crime fighting hobby, daddy Drake obligated Tim to quit. And to be fair to Tim’s dad, I wouldn’t want my son jumping off rooftops wearing a bright red and green costume either. Stephanie, anxious to prove herself, snuck into the Bat cave, and forced Batman to make her the next Robin. This lasts about five issues. Stephanie broke Batman’s rules. Wayne’s refusal of Stephanie actually led to the major event War Games, which is a crazy complicated and tragic story that I’m not going to go into. But cut to 2009. Wayne’s currently dead and Nightwing becomes the new Batman. 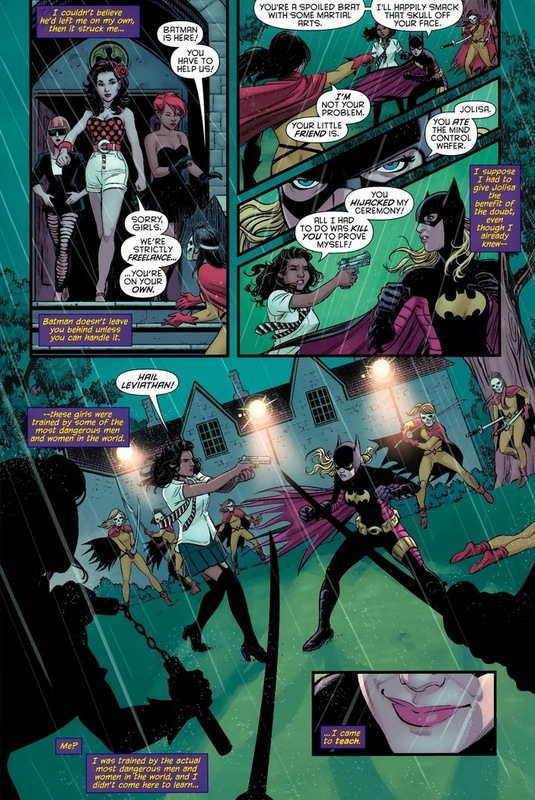 The current Batgirl, Cassandra Cain, has given up the role, and Stephanie used the opportunity to claim the job opening. 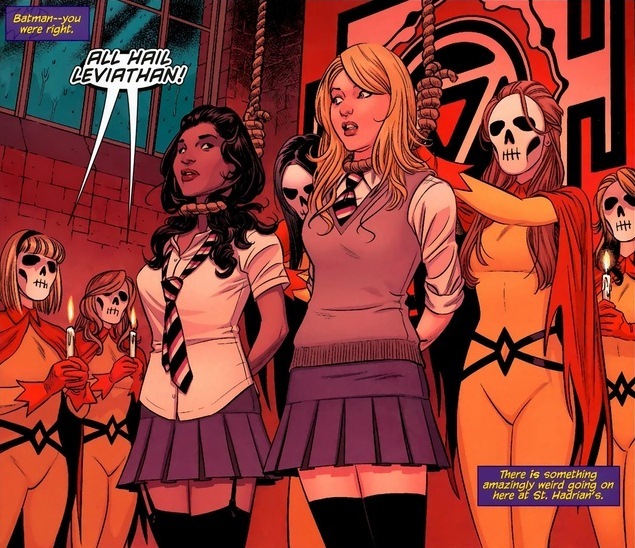 So with DC rebooted and Stephanie gone AWOL, where did she go? I’m here to answer that question. 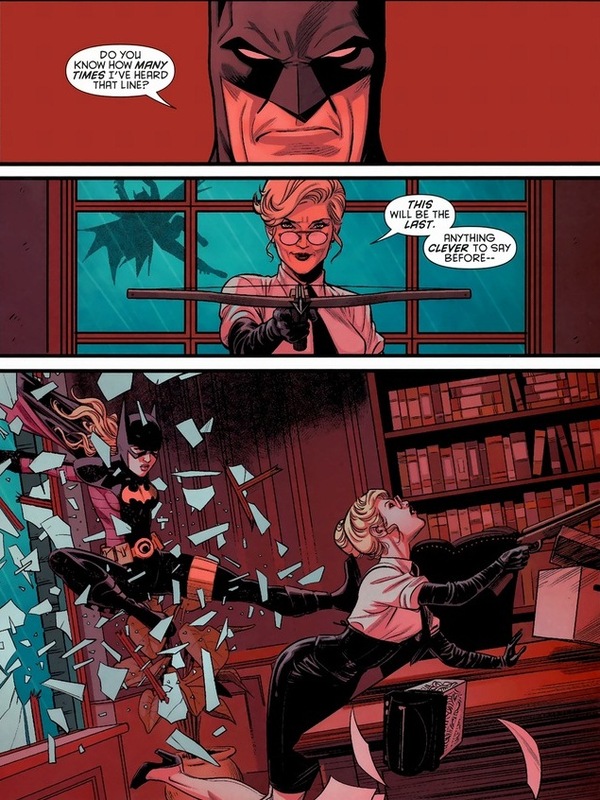 Lean back, sip your beverage, and fall in love with the only blonde Batgirl once more. 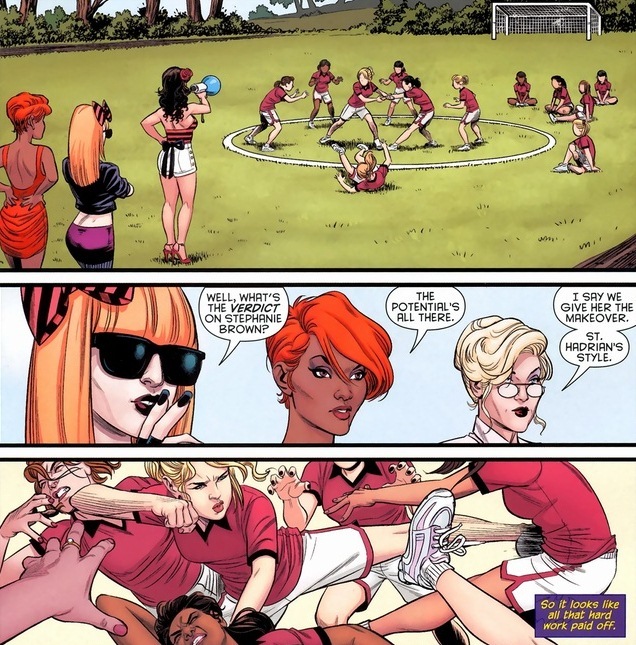 Stephanie’s sent deep undercover to break up an all-girl assassin prep school. Yes, I’m excited too. Just like your science classes, right? No doodling in explosives class, students. Who hasn’t had a firearm pulled on them in the gym locker room? 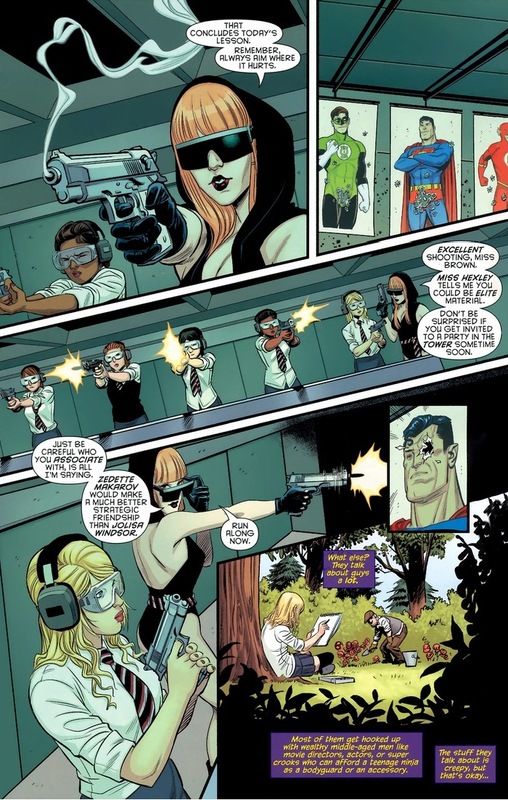 But c’mon, she’s secretly Batgirl, and guns are what wussies use. And their tests? Not exactly standardized. Luckily, a good decade or so of training alongside the finest superheroes in the DC universe allows Stephanie to practically cheat. 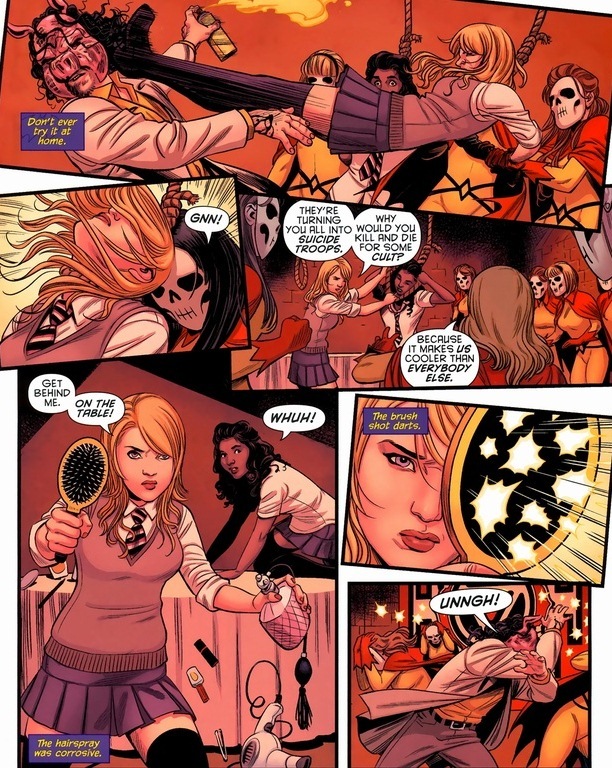 She’s taken out Clayface and Scarecrow, so a gaggle of teenage girls isn’t really a terribly stressful situation. Yup, now we get to see the dirt behind the official induction ritual. What makes this school so evil that Batman plans to break it up? Here’s a hint: it’s not the chess club. 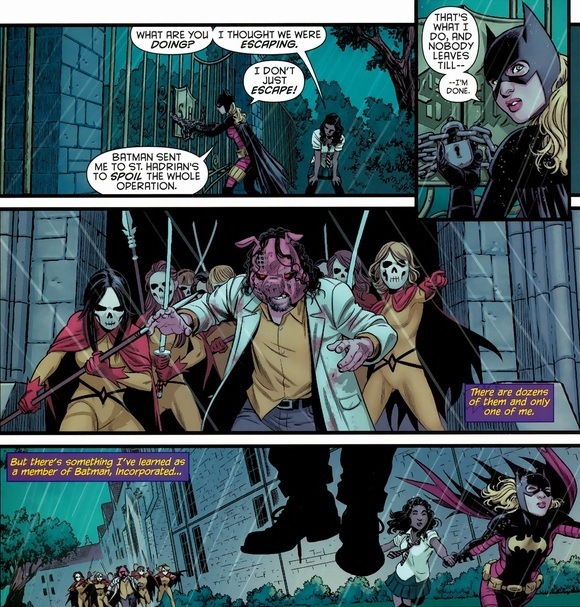 Professor Pyg(‘s son)! Just another wacky supervillain Gotham scientist, who carves up people and spreads mind-controlling gas. 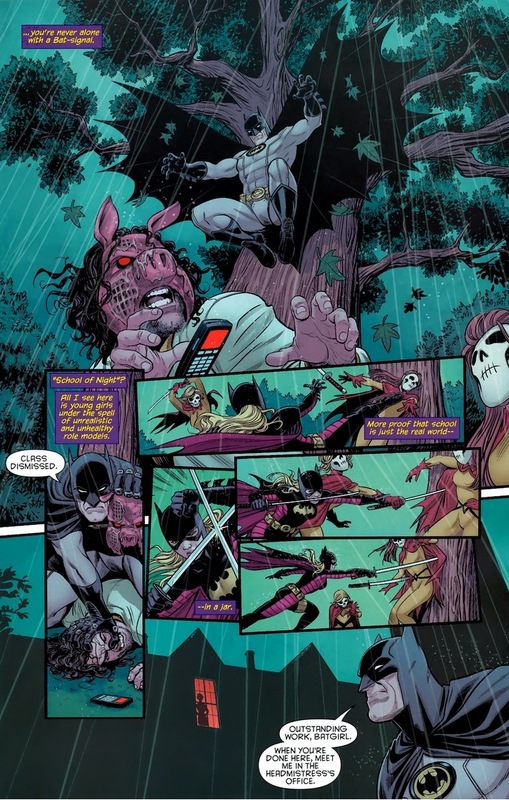 He’s only been around for five years or so, but Professor Pyg’s one of the craziest villains Batman’s ever gone up against. Oh, and I guess he has a kid. 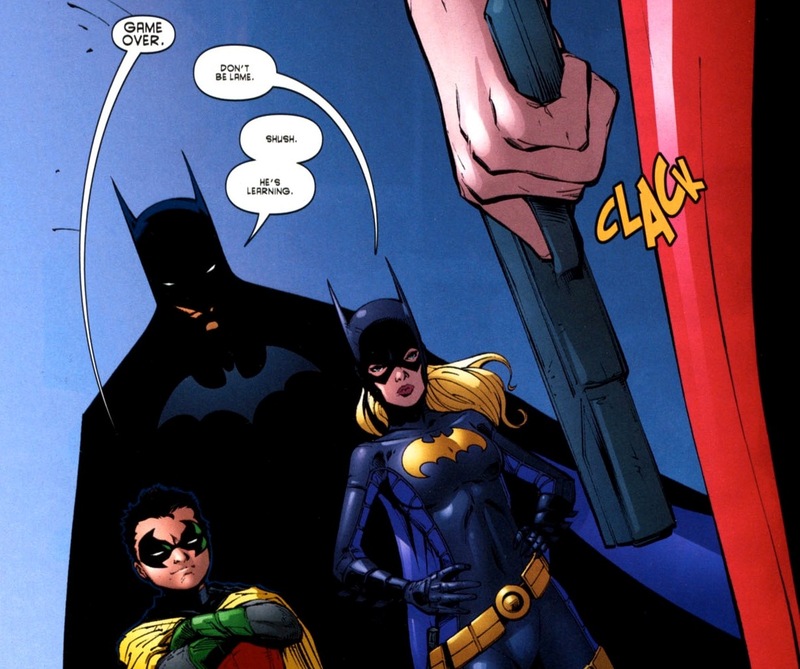 With her cover blown, our lovely hero’s going to have to take down the school the only way the Bat family does: kicking the crap out of all of them. What a beautiful, fist-pumping moment we just experienced! You know why Batman and his group always win? Because they’re better than everyone else. Superpowers are for losers. 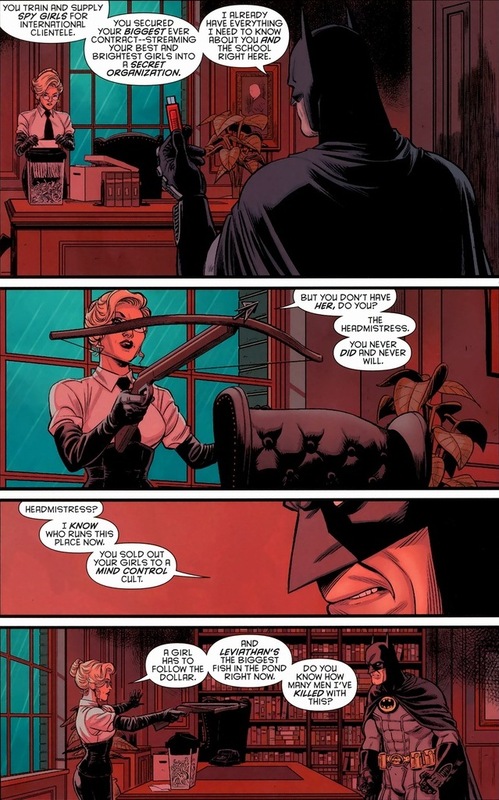 Also, keep in mind Stephanie has spent her entire comic book existence trying to prove herself to Bruce Wayne. He rejected her as both Spoiler and Robin. He refused to let her participate in patrols or training. She accidentally unleashed the largest gang war Gotham City has ever seen. So when Batman gives his indirect approval, that’s winning the superhero lottery. Oh, and as our story comes to an end, I won’t send you off without learning a partial truth behind the evil killer academy. You deserve it. The identity of the headmistresses? You’re going to have to read the rest of the issue to find that out. But anyway, mission accomplished! Though for her sake, I hope Stephanie’s school credits will transfer. 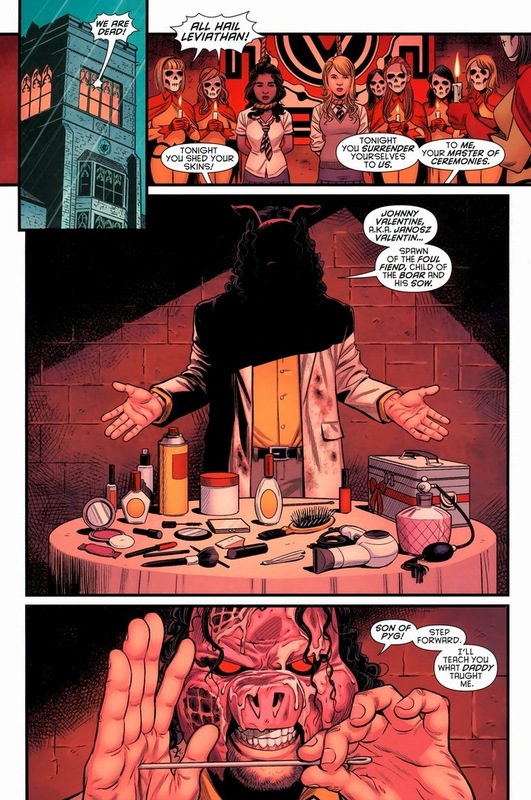 Read Batwoman # 0 if you haven’t: it’s awesome. 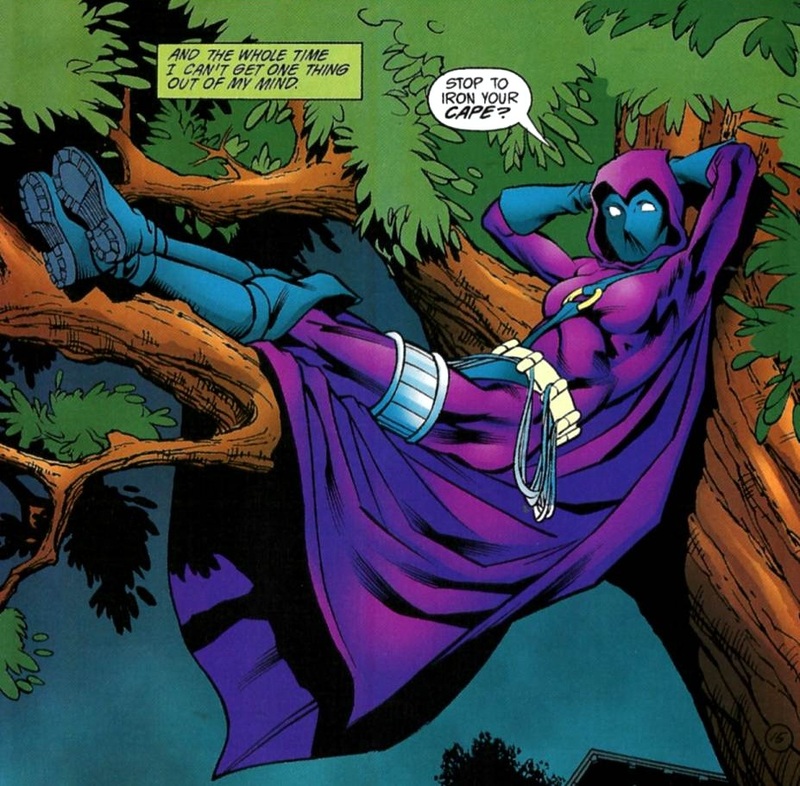 I need to buy all the Stephanie Brown comics. Like now. Reblogged this on Twilit Dreams Circle.